If the the Wyoming Boilermaker wasn't your cup of ... beer ... then this cocktail will spin you right around. Guys, we're going to Florida. The Rum Runner cocktail was created in the 1950s when a bar in Islamorada, Florida, needed a quick way to get rid of extra rum — so they whipped a batch of these strong ones. It has a grocery list of ingredients, but just make sure to keep the proportions even and you’ll be fine. (Oh, and don’t drink too many of these out in the sun, or you may not be so fine.) The cocktail got its name from the real-life rum-runners who inhabited Florida’s islands in the 1920s and 1930s. Rum-running is just a more pirate-y way of saying bootlegging — the illegal transportation of alcohol was most prominent in Florida during Prohibition. The peninsula state had easy access to cheap rum from the Bahamas, so its speakeasies steadily maintained their rum supply during those 13 years of sobriety. Nowadays, drinking a Rum Runner transports you to sunny Florida. Mix those fruity liqueurs with rum for a tiki cocktail that can be made blended or on the rocks. Either way, alternatives are popular, so feel free to mix and match to create the perfect tropical drink. Ingredients 2 cups of ice 1 oz pineapple juice 1 oz orange juice 1 oz blackberry liqueur 1 oz banana liqueur 1 oz light rum 1 oz dark or aged rum A splash of grenadine 1 oz 151 rum Orange slice for garnish Directions For a blended Rum Runner, fill your blender with ice and add all the liquid ingredients except the 151. Mix until smooth and pour into a hurricane glass. Garnish with orange and float 151 on top. 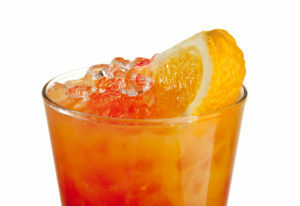 For a Rum Rummer on the rocks, fill a glass with ice, add liquid ingredients, then add the 151 floater and orange garnish. A twist The Hurricane is another rum classic. It was invented in New Orleans, but it’s still perfect for sipping poolside in the Florida Keys. Ingredients 1 oz vodka 1/4 oz grenadine syrup 1 oz gin 1 oz light rum 1/2 oz 151 rum 1 oz amaretto almond liqueur 1 oz triple sec Grapefruit juice Pineapple juice Directions Fill a hurricane glass three-quarters full of ice. Pour in all the liqueurs, then fill with equal parts grapefruit juice and pineapple juice.